Chop With the Flick of a Wrist! This product is no longer available. Check out the Other Kitchen Choppers we have in stock. Just twist back and forth to quickly reduce vegetables into perfectly chopped portions. The double-sided blade system allows you to cut in both directions using incredibly sharp, German steel blades. This chopper is a convenient size and offers up one of the easiest ways to chop vegetables. It is so easy-to-use, that anyone can produce great results in just minutes. Just pop an onion or other veggie into the container, and with a few quick flicks of the wrists, the onion is reduced to a fine chop. Because it cuts in both directions, not a single motion is wasted. Cleanup is easy too. With no cutting board necessary, and the Twist and Chop being dishwasher safe, you will never have to worry about a big mess to clean when you are finished cutting. Keep your hands and countertop clean, and chop onions without crying. Thanks to the clear bowl, you are able to see exactly what your progress is. Chop food quicker and make the job easy. 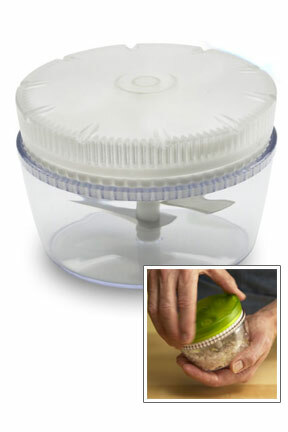 This great food chopper even comes with an additional bowl with a lid for storage purposes. Cooks are forever looking for easier, quicker ways to accomplish kitchen tasks. Chopping is probably the most frequent cooking direction in any recipe. It is made easier, cleaner and quicker with this amazing hand held chopper. The Twist and Chop quickly and easily chops your favorite foods. It is one of the most compact and quickest chopper available in the market. Multiple gears inside the lid increase the cutting force while making the twisting action smooth and effortless. The addition of double sided blades that chop in both directions make this choipper incredibly efficient. Thanks to high quality materials and Swiss engineering the Twist and Chop will work great and last for years. Simply pop in any fruit or vegetable in the container, hold the top and bottom with both hands, and give a few quick flicks of the wrist to slice and dice your favorite produce. After you're done, it comes apart for easy cleaning by hand or in the dishwasher. No more stinging eyes and no more tears thanks to this great chopper. Contents are completely contained while chopping, so it is easy on the eyes. It is a Swiss made kitchen gadget featuring superior materials and craftsmanship. The Twist and Chop is designed with a modern look and functional style. Use it to chop onions, shallots, pickles, hot peppers, carrots, celery and more. Order Yours Today! Kuhn Rikon Twist and Chop - High quality materials and craftsmanship make this Swiss made kitchen gadget a must have. A great accessory for anyone that enjoys cooking. Chop veggies with a simple twist of the wrist.